New Zipline! Lake swimming & fishing. Rental houses, cabins & cottages. Gift shop & concession stand. 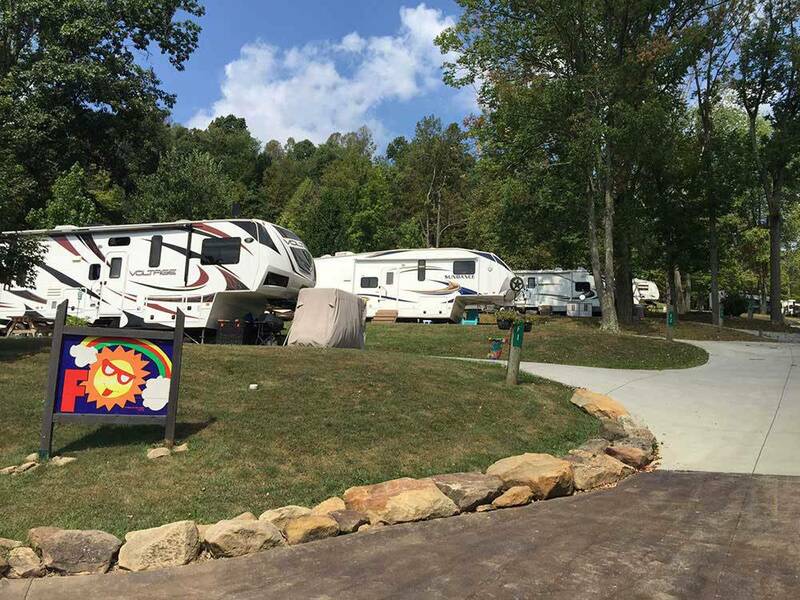 Deluxe RV sites. Minutes off I-77. Near Football Hall of Fame, restaurants and the world's largest Amish Community! Wood’s Tall Timber Resort was a very good choice to stay on our trip. The staff was very helpful and accommodating. Although the property is hilly, the sites are well laid out and level to the point it doesn’t seem crowded. You can rent a golf cart to get around, which makes the large property easy to explore. Zip lining and par 3 golf are available. We stayed only 2 nights, but it was apparent a lot people were seasonal. Besides RV sites, there are cabins and houses to rent. Tall Timber would make a good destination because of all the activities available including a food concession . There’s a large lake with beach, deep water platform and diving board with a Lifeguards on duty. Picnic tables and shelters, swings and benches are plentiful around the lake. Very picturesque and a pleasant place to stay. My family stayed here for the first time for a weekend trip. We liked it so much that I went down to the camp store and book another weekend for later in the summer. The people working there were very friendly and helpful. the place offers allot for only $40 a night for a full hookup site. (only $36 if your a good Sam member) Would defiantly recommend this camp to families looking for a fun place to camp. it is kid friendly so keep that in mind. if your looking to get away for a quiet weekend. this might not be for you. lots of kids riding bikes and scooters and such. but it wasn't crazy loud either. We had a great site up on the hill in section A. we had a pull thru site. The manager was kind enough to have us follow him in his golf cart to our site and helped us park our trailer. the site was much bigger than we are use to. a very nice park without the sounds of the highway. We stay at this campground several times each season. The kids love the lake to swim at with all the in water activities. A nice playground, putt putt golf, par 3 golf, great zip lining, basketball courts (our kids play in the annual 3 on 3 tourney). The owners are always upgrading and keep the place VERY CLEAN. We would definitely recommend it for families. Ours loves it there especially with their friends. It is worth a visit to enjoy yourself. BAD experience. We entered the park and our first thought was beautiful place. We went to register and that's when the good thoughts stopped. They informed us we would have to unload our car before going up to our "PULL-THRU" spot because we couldn't fit it around the corners even though our RV was only 34 feet long towing a mini cooper on a dolly. Something that might have been mentioned when we booked our site. They didn't have a spot to pull over and unhook the car so there we were doing it in the main thoroughfare while other cars were trying to come in. Then they escorted us up to our "PULL-THRU" and made us pull up to the far side so that a tent camper could use the back portion of the site the next day. Now the hose wouldn't reach the hook-up. We let their management know this and said that the spigot was to be shared with the tent they sent someone up with an extension hose so it could reach the back of our RV. As he hands it to us, he tells us we should probably be storing water in our tanks because often on the weekends when they have a lot of people, they run out of water (LOVELY). We looked on the internet at reviews of this place and sure enough people had complained about them running out of water. Can you imagine? We then turned on our water and the pressure was almost nonexistent. We took our dogs for a short walk and there was hardly anywhere we could walk them -not a dog friendly place at all. We started adding up the negatives about this place and decided to leave early especially because a Volley Ball tournament was scheduled on Saturday, our departure date, and the manager said we would be hard pressed to find a spot to hook the car up again because of the traffic jams foreseen. We told them about the problems and they just shrugged their shoulders and said "sorry" totally not concerned we were unhappy in the slightest and wouldn't give us our money back. This park is very pretty, but not concerned with their customers at all and lack amenities. Imagine paying for a pull-thru that you can't get your car to and have to share with a tent and my favorite, running out of water. I give this place a 0 rating.